Regular readers of this blog will know that I’m a big fan of the Netbook. And I’m not alone. A recent DisplaySearch report reveals that sales of these low-cost mini notebook computers grew 160 per cent in Q3, with the research firm predicting that a total of 14 million Netbooks will ship this year, up from just one million in 07. 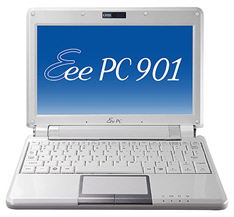 It seems that 08 is the year of the Netbook (see my top ten Digital Lifestyle products of 08). In terms of individual performance, Acer (Aspire One) and Asus (Eee PCs) are leading the pack with 38.3 per cent and 30.3 per cent market share each, while Dell (2.8 %), MSI/Medion (7.8 %) and HP (5.8 %) trail significantly. What’s less clear, however, is how Netbooks are actually being used. Or more specifically, what role they play in a user’s digital life. For my own needs, I bought a Netbook, in part, out of tech curiosity and also as a lightweight and inexpensive PC when traveling. I’m much less keen on taking my beloved but overpriced Macbook out on the road and, in comparison, a Netbook wouldn’t cost too much to replace if it was damaged, lost or stolen. In that sense, my Netbook plays the role of a ‘third machine’ — in addition to my iMac and Macbook — just as the PC industry intended. Beyond mobile computing, another use case scenario for Netbooks that I’ve observed, both upfront and anecdotally, is surfing the web, Instant Messaging or updating Twitter/Facebook while sat on the couch watching television. A luxury maybe but something we’ll see more and more of as we become increasingly ‘connected’ (I’ve also seen/heard of people using an iPod touch or iPhone for the same purpose). So how do you use your Netbook? Primary laptop or ‘third machine’? Let us know by leaving a comment. I love the idea of hangbag computing. Nice. I’m a fast typist (100+wpm), but just can’t get the hang of the tiny keys on my DELL netbook. I’m ready to return it. Is this not a problem with the rest of you? RE: typing- There are some things to get used to, but I don’t really mind. I once got used to hitting Control “v” every time I needed an “a” because my “a” key stopped working. In comparison, the quirks of the Eee keyboard are nothing. Typing really fast is a bit of an issue for me. Not because the keyboard is small but because the keys are spaced very differently to my Macbook. If I wasn’t switching between the two so frequently, it wouldn’t be a problem (the Macbook keyboard took me a while to get used to in the first place). I’ve been using my EEEPC 4G surf for six months now, and it has a couple of obvious design problems (heat from below the keyboard is noticeable, and the keys are just too tiny) though they didn´t put me off it. I mostly use it for typing my assignments for university when I’m at the library or anywhere else; I find it really good at picking wireless signals, and I’ve gathered quite a lot of pictures of the eeepc disassembled just in case I wanted to attach an extra antenna to its wireless card, or an internal shdc card. I installed Windows XP in it, MS Office 2000 (Word, Excel, Powerpoint, Access) and Copernic Desktop Search 2. Launchy comes in handy because you don’t need to abuse the left button of the keypad, among other reasons. Sometimes I like to rotate the screen and keypad altogether with eeerotate. And it really boots up fast. Great for traveling, especially for international flights. Small, lightweight, decent battery life possible. Given the affordability of the larger lap tops and 20″ etc. screens, it’s hard not to want a little guy for on the move and a larger unit for @ home or a stationary office. Great addition to the true digital lifestyle.